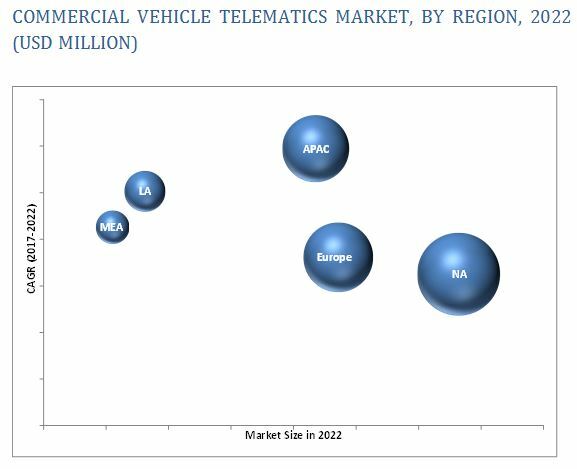 [148 Pages Report] The commercial vehicle telematics market is expected to grow from USD 7.31 billion in 2017 to USD 18.43 billion by 2022, at a Compound Annual Growth Rate (CAGR) of 20.3%. The base year considered for the study is 2016 and the forecast period is 2017-2022. The factors contributing to the high growth of the market are the adoption of NGTP protocol, increased usage of smartphones, decreasing cost of sensors, and growing government mandate for adoption of telematics in commercial vehicles. These factors are also expected to shape up the future of the global commercial vehicle telematics market. However, the market faces security and privacy issues as the major hurdle. Governments across the globe are now focusing on making the vehicles efficient. As of now, many regional governments are focusing on deploying vehicle tracking in commercial vehicles. For instance, in May 2016, Ministry of Road Transport & Highways, Government of India, has issued a notification for all transport vehicles to be equipped with vehicle location tracking device, Closed-Circuit Television (CCTV)-based surveillance system, and one or more panic/emergency buttons, which would be fitted by the manufacturer or their dealer or the respective operator. The major factor behind this mandate is safety. Since, remote tracking enables the authorities to track any vehicle that deviates from its route, it helps the authorities to take corrective actions. Moreover, the deployment of telematics solutions enables better fuel and route management, which in turn saves fuel, curbs additional carbon emission, and increases the lifecycle of vehicle parts. Governments are increasingly aware of the need of using telematics technology in the long run, and hence, partial deployment planning and deploying phase has been initiated and is expected to be completed within a planned time. To profile key market players, provide comparative analysis on the basis of business overviews, regional presence, product offerings, business strategies, and key financials, and to illustrate the competitive landscape of the market. The commercial vehicle telematics market ecosystem includes players such as PTC, Inc. (US), Trimble Inc. (US), TomTom Telematics BV (Netherlands), Verizon Telematics, Inc. (US), Mix Telematics International (Pty) Ltd (South Africa), Zonar Systems, Inc. (US), Octo Telematics Ltd. (UK), Omnitracs LLC (US), Masternaut Limited. (UK), Microlise Group Ltd. (UK), Inseego Corporation (US), and Volkswagen Commercial Vehicles (UK). These Commercial Vehicle Telematics Solution Vendors are rated and listed by us on the basis of product quality, reliability, and their business strategy. Please visit 360Quadrants to see the vendor listing of Commercial Vehicle Telematics Solution. In May 2017, TomTom Telematics and OBS Logistics, a transport management software specialist, entered into a partnership to create a new vehicle checking solution for haulage and logistics operators. The new solution would help capture accurate information for Driver and Vehicle Standards Agency (DVSA) and Fleet Operator Recognition Scheme (FORS) compliance records. In June 2016, Verizon Communications acquired Fleetmatics Group, a fleet telematics solutions provider, for USD 2.4 billion. The acquisition would bring Verizon over 42,000 customers, 826,000 subscribers, 1200 professionals, and a wide range of product portfolio. In February 2017, Octo Telematics entered into a strategic alliance with Guidewire Software Inc., a US-based software provider for general insurers. Octo Telematics joined Guidewire PartnerConnect, a global network of Guidewire products, as a solution partner. The commercial vehicle telematics market takes in account, the commercial vehicles’ adoption and deployment of telematics technology to achieve control over the vehicle along with improved productivity and increased operational efficiency. What are the key developments which the OEMs and aftermarket CVT vendors have undertaken? The commercial vehicle telematics market size is expected to grow from USD 7.31 billion in 2017 to USD 18.43 billion by 2022, at a Compound Annual Growth Rate (CAGR) of 20.3%. The major drivers of the commercial vehicle telematics market include growing government mandate for deploying vehicle tracking in commercial vehicles and rising demand for smartphones supplements the adoption of telematics solutions and services. The scope of the report covers the commercial vehicle telematics market analysis by type (solutions and services), provider type, vertical, and region. The safety and compliance solutions segment is expected to grow at the highest CAGR during the forecast period owing to increasing concerns of governments across the globe for safety and compliance to avoid theft protection, accident communications and others. Various governments across the globe have passed regulations to define the driver work hours, fuel efficiency and consumption, safety policies, laws and others. The professional services segment is expected to have the largest market share during the forecast period owing to the need of technological consulting, and continuous support and maintenance activities for the deployment of smart technologies. 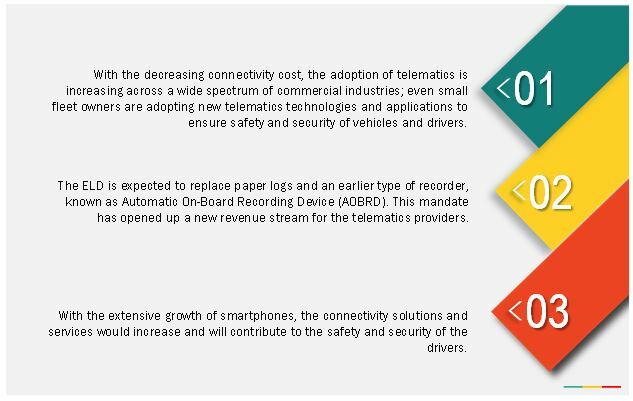 The OEM telematics provider type segment is expected to grow at the highest CARG during the forecast period owing to increasing trend of providing OEM-embedded telematics solutions and due to their extensive foothold in manufacturing embedded modules and strong technological leadership. As per the geographic analysis, Asia Pacific is expected to witness a highest growth in the commercial vehicle telematics market during the forecast period due to the untapped market strength, increasing awareness about driver safety and accident prevention, upcoming regulations to improve road safety, presence of leading OEM players, growing transportation and logistics industries, and advent of 4G LTE technology and smartphones. The major restraining factor that is limiting the commercial vehicle telematics market growth is increased communication leading to security and privacy concern, which is affecting and halting the development of government projects midway. The major vendors profiled in the report include PTC, Inc. (US), Trimble Inc. (US), TomTom Telematics BV (Netherlands), Verizon Telematics, Inc. (US), MiX Telematics International (Pty) Ltd (South Africa), Zonar Systems, Inc. (US), Octo Telematics Ltd. (UK), Omnitracs, LLC (US), Masternaut Limited (UK), Microlise Limited (UK), Inseego Corporation (US), and Volkwagen Commercial Vehicles (UK). Transportation and logistics is one of the leading verticals that deploys commercial vehicle telematics solutions on a large scale. The transportation and logistics vertical uses telematics solutions for monitoring, tracking, managing, and upgrading fleets, such as trucks and trailers, LCVs, and M&HCVs. Government sector fleets face various challenges, including tight budget, regulations/policies, and state and local compliances. The government sector is exploring solutions that can help meet the budget constraints and are flexible enough to tackle technological changes. Commercial vehicle telematics solutions are utilized by the utilities vertical for managing fleets, which include LCVs and M&HCVs. The telematics solutions for utilities are often aimed at improving fleet visibility through optimized routing techniques, analyzing driver behavior and vehicle performance, and enhancing operational efficiency. The profound use of commercial telematics in the healthcare vertical has changed the dynamics of patients and healthcare providers. Some of the benefits provided by telematics in the healthcare vertical include report generation on staff hours, time analysis spent on the road between visits, location tracking of staff at emergency calls for dispatching one who is nearer, reports on staff journeys, two-way communication, and improvised efficiency and responses. 11.5 Mix Telematics International (PTY) Ltd.